The Frunze, 1940 ("Schastlivy" type) is a rank III Soviet destroyer with a battle rating of 3.7 (AB/RB/SB). It was introduced during Update 1.79 "Project X" when the Soviet fleet was implemented into the game. The Frunze has 4 x 102 mm cannons as the main weapon. These guns have decent firepower and fire rate but are far from the best brawling weapons. The greatest advantage of these guns is the high accuracy which they have. As such, the Frunze should be played as a sniper destroyer more so than a close-range brawler. The accuracy of these guns at long range far surpasses the other equivalent destroyers of other nations and can be used to shell enemies from far range with impunity from more inaccurate enemy fire. Another point worth mentioning is the fact that the arrangement of the guns is not exactly the best, with a single gun at the front and the 3 others all at the back. This means that you can only use a single gun against a target directly in front of you. 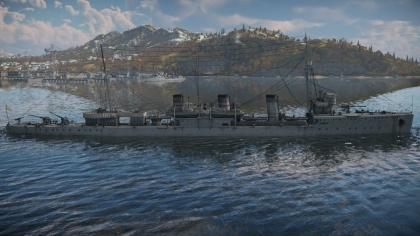 In addition to the 102mm cannons, the Frunze has a 76mm and a 45mm cannon. These guns fire HE shells and are essentially the only defence the ship has against aircraft, and even in doing so are sub-par. They aren’t particularly good at tackling small and manoeuvrable patrol boats either. Simply put, the Frunze is a sitting duck for any planes with any kind of bomb or torpedo. There are two superfluous DShKs on each side of the bridge, but the firing arc of these guns make them unusable in almost all conceivable situations. The main weapons that are used as anti-aircraft are the 76mm and 45mm guns on the back of the Frunze, and unfortunately, these guns are sub-par at tackling mobile targets. The Frunze has 3 x 3 450 mm torpedo tubes. They can only attack when pointed at the sides, and cannot fire directly forward. The Novik-class series, which includes the Frunze, comprised of the most modernized destroyers among their class in the Imperial Russian Navy. This combat ship was laid down in Kherson in 1913 and received the designation “Bystry.” Following six months of construction, the destroyer was finally launched and soon allotted to the Black Sea Fleet. In 1918, the destroyer was captured during the German occupation and later, passed into the hands of the Anglo-French interventionists. She was then taken out of commission during a retreat and was only able to join the armed forces ranks under the Soviet flag in 1927. The destroyer joined the Second World war under the designation “Frunze.” In the war’s summer of 1941, the ship was tasked with setting up minefields in the Black Sea and escorting convoys of transport ships. She also defended Odessa during its siege. 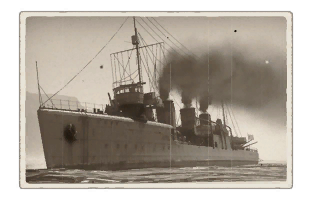 On September 21st, the Frunze was attacked by the seasoned I Group pilots of the StG 77 wing during her attempt to rescue the Krasnaya Armenia gunboat bombed by Junkers aircraft. The Stukas performed numerous group raids on the destroyer, which resulted in the ship getting hit by several 250 kg bombs and consequently sinking.